As a former actor-turned-entrepreneur, I am always delighted and intrigued when businesses forge meaningful alliances with the arts. The performing arts have always been a critical mouthpiece for self-expression and have been both backdrop and centre stage of countless business dealings and corporate interactions. What better way to illustrate a business’ influence, prowess or innovation than by creating an unforgettable positive moment that will continue to live in its audience’s mind? In a digital age especially, unique and tangible experiences are at a premium. Brands and businesses now more than ever need to wow and inspire, producing the unexpected from both over-the-top moments and subtle detailing. Corporations are embracing culture and community engagement, softening their approach to include their audience, as opposed to just showcasing their wares. Immersive theatre has joined forces with experimental originality to create a fantastic movement in events management. Recent notable examples include, Punchdrunk, Secret cinema, Shunt and of course, Private Drama. Immersive theatre is an incredibly powerful art form as it puts the audience at the centre of their own experience allowing them to create their own story by interacting with the performers. Immersive theatre has incorporated Shakespeare’s theory of ‘all the world’s a stage’ into its central manifesto. Theatre companies are constantly on the search for bigger and more obscure venues, which will enhance the experience of their audiences. The award winning theatre company Punchdrunk, one of the most innovative and experimental theatre companies on the scene, recently collaborated with Sony Playstation, to promote the release of Resistance 3. For this performance they created, alongside a team of actors and designer, an experience inspired by the game in a myriad of tunnels under Waterloo station, making the apocalyptic setting of the game a horrifying reality for their audiences. Private Drama recently transformed the Old Sorting Office in New Oxford Street for a corporate gala from an industrial, disused car park into the sultry Spain of the Royal Opera House’s Carmen. Guests arrived for a corporate gala, ushered in from the cold, dark London street to discover the warm landscape of Seville, orange trees, terracotta walls, baskets of Mediterranean fruit, dappled sun light and fountains mixed with wandering musicians strumming Spanish guitars. Theatre novices and aficionados alike experienced a truly unforgettable performance of a timeless play. Critically immersive theatre is breaking the fourth wall bringing its audiences into the drama itself. Secret Cinema has invigorated the cinema-going experience by its very secretive nature, engaging curious audiences with the promise of real-life interaction with the characters of iconic films – and playing a part themselves. From Shawshank Redemption to Alien to Brazil, audiences blur identities with performers and entertainment reaches new heights of originality and fun. And that’s all before and during the actual viewing of the film. This formula has proved so successful that film studios are now using this format with Secret Cinema to launch new release films, traditional theatres and even venues are falling in line to adapt the concept around the world. The mission? Surprise, delight, and retell classic stories in continually original ways. Immersive theatre companies have recently begun to utilise a variety of mediums in order to create a fully immersive and visceral experience for their audiences. This has led to much speculation as to whether immersive theatre can indeed still be referred to as purely theatre. Alongside Private Drama, Punch Drunk, Shunt and Secret Theatre have brought dance, song and real-time performance art to the stage. In one of their recent reproductions of ‘Show Two’, Secret Theatre had the backdrop of their performance painted and constructed as the performance progressed, often sensitively to the audience’s own reaction. As a forward thinking artistic movement immersive theatre has synthesised old world theatricality with the technological advancements of the modern world. At the opening of the Siemen’s Crystal building in Royal Victoria, Private Drama was given the opportunity to showcase some of our tech production highlights. In this event the performance took place both on the stage, in front of the audience, and on the face of the building itself through digital projections. Costume has endured and evolved as an indispensible tool to join up diverse elements of immersive theatre. 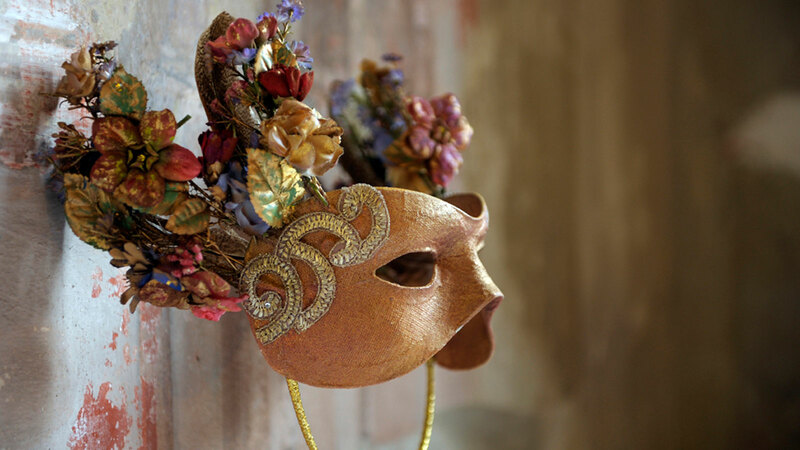 Punchdrunk , who were the original implementers of the innovative use of masks, use costume to empower and incorporate its audiences into the performance. Watch this space in 2014 as we showcase more of Private Drama’s original forays into the rich territory of immersive theatre. From innovative to traditional, brands trust our vision and indeed passion to create unforgettable moments that enhance their own stories. If you happen to join us, we think you’ll recognise our touch by the suspension of belief, and shared experiences you’ll treasure for years to come.